Visit the Alhambra in Granada is an experience that everyone should do at least once in life, but to buy Alhambra tickets is not always easy, so we recommend that if you are staying a few days in Granada and want to discover the Red Fortress, you should buy your tickets in advance, as normally there are long queues at the box office and tickets for the Alhambra sell ut quickly. Due to the large number of people, we recommend to arrive at the monument in plenty of time, especially during weekends and holidays. In this article we give you the key facts about the different Alhambra tours and tickets that are offered, so you can choose the one that suits you and what you're looking for. Guided tour: Once you have decided to visit the most important Islamic monument in Spain, and considered by many as one of the wonders of the world, what better way to make the most of your visit is by combining your entry with the Alhambra tour that suits you, either in the morning or afternoon, with an specialized official guide. An assistant guide will pick you up at your hotel and after a short city tour through Granada, you will arrive at the Alhambra Palace where you will begin your exploration with your official guide who will provide you with all the information there is to know as you walk through Nasrid Palaces, the Alcazaba Fortress, the Palace of Charles V and the Generalife Gardens. If you prefer to get to the Nasrid Complex on your own, you can also take this tour without hiring transport. 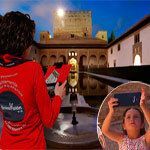 Do not miss all the details in our article How to get to the Alhambra. 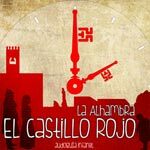 Exclusively visit: Treat yourself and hire a private guide for you and your group of friends, your family or your traveling companions with your tickets for the Alhambra. 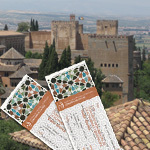 Single ticket: If you are not interested in an Alhambra tour, you could combine your individual ticket with our GPS Audio Guide Tourist Navigator, a system that allows you to visit all areas of the monument as you want, while you are listening to the explanations accompanied by detailed images of the most important rooms and with a geo map that will help you to position yourself easily. 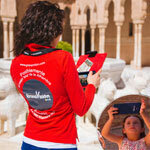 You will also have time to explore every corner of the magical city of Granada with your Navigator: cultural offer, tapas tour, monuments, museums, exhibitions, nature... anything you want to know is in this Tourist Navigator. 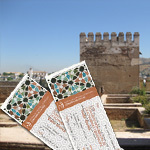 If what you want is simple single Alhambra tickets, you can acquire it at the entire ATM network 'La Caixa', financial institution collaborating with the current contractor Serviticket service through Internet www.alhambra-tickets.es by calling 902 888 001 or at the Alhambra Store located in the Reyes Católicos Street Nº 40 in Granada.